A cruise ship docks at the Vieux Port along the Dufferin Terrace in Old Quebec in Quebec City, Canada. From the Terrasse Dufferin in Quebec City in Quebec, Canada you can overlook Vieux Port, home to modern buildings, heritage buildings, a waterfront walkway where a cruise ship can easily dock and spectacular scenery. The cruise ship arrives and departs from this port giving tourists to Quebec City a chance to explore this beautiful place. Vieux Port seen from Terrasse Dufferin, Dufferin Terrace, in Old Quebec, Quebec City, Quebec, Canada. UNESCO World Heritage Site. 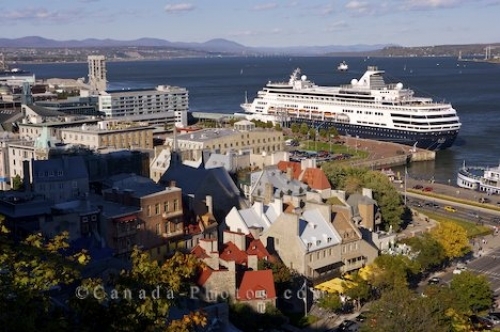 Picture of Vieux Port from the Dufferin Terrace in Old Quebec in Quebec City where a cruise ship awaits its passengers.